Steel quantity of a beam can be calculated easily by following Bar Bending Method; it is a simple and easy method to calculate steel quantity for any kind of beam. Estimation or calculation of steel reinforcement quantity for concrete slab, footing and column, beams etc. is very important for the cost evaluation for the construction. Design drawings are used as a base for calculating rebar quantity in various structural elements. Bar Bending Schedule plays an important role in the construction of High rise buildings; it is very important to know about Bar Bending Schedule to find out the required quantities of Steel reinforcement for every component of the building. 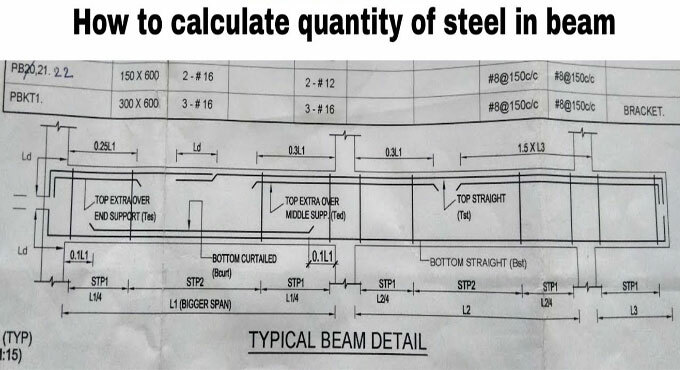 This article will show the method of calculating Quantity of Steel in beam through Bar Bending Method, it is an easy and simple method that will help to calculate any types of beam. • Reinforcement: In Bottom straight bar- use 16mm diameter for 2 times, in Top bar- use 12mm diameter for 2 times and in stirrups- use 8mm for 230 distance-to-distance. • Covering: 40mm at bottom and top sides, 25mm at sides. • At first, a bar bending schedule has to prepared to classify different shapes of bars like bent up bar or straight anchor bar or eos bar or curtail bar etc. and diameters. • Then all the given shapes of bars from the drawing have to list down. • Then it is the time to calculate the cutting length of each of those bars. • Next calculate the unit weight of each diameter bars by applying formula. • Then calculate the weight of rebar. • Then add all the weight to get the total steel quantity.